“Who’s Minding the Store: the Small Grocery Business in Ventura County” focuses on sharing the history of many immigrant-owned markets in the county. As World War I ended and the Roaring ’20s got under way, Tomai Yeto dropped out of school in Oxnard and began to support his family. For years he worked at the Limoneira Co. packing house in Santa Paula, living frugally and building up his savings. 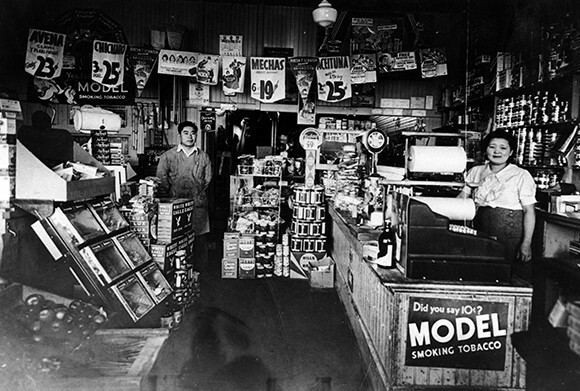 In 1929, Yeto, then in his early 20s, had enough money to buy a grocery store in Saticoy. The story of Yeto’s Market, along with many others, is being told at the Museum of Ventura County in an exhibit opening June 13. “Who’s Minding the Store: the Small Grocery Business in Ventura County” focuses on sharing the history of many immigrant-owned markets in the county. Yeto’s story is one of tragedy, perseverance and a bit of luck. After the bombing of Pearl Harbor, America entered World War II and Yeto nearly lost everything because of his Japanese heritage. Yeto and his family became victims of a wave of anti-Japanese sentiment that led the government to round up 100,000 U.S. citizens in the name of national security. He had to leave friends and neighbors behind as the whole family was shipped to the Gila River internment camp near Phoenix, Arizona, according to government records. His son, Masanobu Yeto, was 7 years old at the time. Many of those interned had to quickly sell their own businesses for bargain-bin prices, losing most of their assets. But Tomai Yeto was one of the lucky few. He was able to lease his market to a local woman, known only as Ms. Gonzalez, who kept it running throughout the war. When the war ended and the camps were closed, Yeto and his family moved back to the area and reclaimed their property. The market continues operating to this day. Yeto’s Market served the community with needed goods and produce in an old-style wood building. The store sold bulk goods to laborers and farm workers, and many items were sold on personal promises of paying and store credit, Masanobu said. There were only a few similar stores in the area, and many served as community gathering places. Customers in the rural Ventura County community would often come to the store to catch up with friends and learn community news, Masanobu said. In 1971 the store moved a block down the road and Masanobu took over the family business. Today, Yeto’s Market continues to fill an important need in the small farming community. 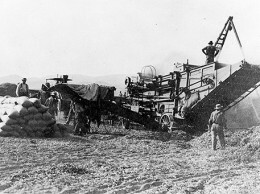 Along with food and supplies, stores provide places for people to share news and gossip in towns such as Saticoy, said Museum Executive Director Myron Freedman. The museum’s exhibit is divided into three sections. One displays large photos and original artifacts from the stores, including a 100-year-old cash register and a silt-filled ledger book that survived the St. Francis Dam Disaster, which caused damage throughout the Santa Clara River Valley. It also has original scales, store signage and an antique Budweiser beer can. An interactive section lets patrons touch and use a small recreation of an early 20th-century grocery-store, complete with signage reminiscent of the era. The last section display even more stories and photos from the museum’s large collection. Many of the photos and objects came directly from family members, many of whom continue to operate stores today. 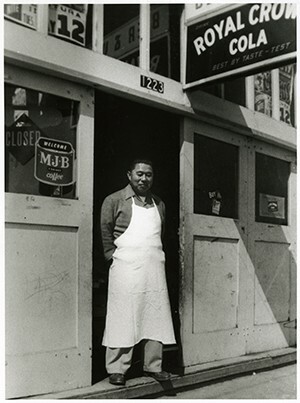 A photo of Tomai Yeto standing at the store’s entrance in a white-butcher apron is displayed prominently in the exhibit. Masanobu said seeing photos of his father in a museum made him think about the history of his family in California. “Wow, we were really here,” he said.